I am embarking on a new orchid adventure. I've decided I'm going ot try my hand at growing Disa. For those of you who haven't heard if Disa, let me tempt....er, tell you a bit about them. They are actually a rather large genus (somewhere near 200 species) of South African orchids (though I am told one species has invaded Australia and now grows in the wild here). The more popular species like Disa uniflora have very showy flowers in the red/yellow/orange spectrum and are apparently more popular both for this reason and because they seem to be a little easier to cultivate. I have 2 of the pots under 70% shade cloth and 2 in brighter light (shaded area no shade cloth). I have them sitting in dishes of water and am watering them with a mix of Melbourne city water and rain water. I'll keep you posted n their progress. Andrew (or anyone else who grows these fantastic orchids), please feel free to offer advice and give direction as you see fit. Oh wow.... Can't wait to see the progress with them! They are beautiful. How many years before they bloom? Admittedly I grow my Disa in deep pots, which makes the stems long, so there may not have been much room left inside your pot to fit the whole plant in. I don't know what effect planting that high in the pot will have on the plant or to what extent rosettes will open out to adjust to the high planting. I've never planted them like that to see what happens. I suspect most of them will be fine but I'm concerned the bottom left plant may become unstable when it flowers. They are quick to flower. I've had them flower the same year they were deflasked but I usually won't let them flower that early as they often don't have the energy to produce a flower and a replacement tuber. Mature plants will usually produce a flowering sized replacement tuber after flowering plus a few tubers that will be flowering size following season as well as shooting from tuberless stolons, which usually take a little longer to flower. Thanks for the advice Andrew. I do have some deeper pots and I'll repot them deeper. WOW! Looking forward to the new adventure! Good luck and keep us posted! I love these plants! Perfect for us growers living in more temperate locations, as they can be grown in a cold frame greenhouse, seasonal temperatures here match their lifestyle very well. I use a peat/perlite mix and grow them alongside CP's like Cephalotus and Sarracenia, as they enjoy very similiar conditions. For me personally, they are one of the easiest orchids to care for, simply requiring a tray of rainwater and shading from the harsh summer sun. They're brought into a cool room during winter to avoid frosts. The only problem I've read about growing these plants is their intolerance of high temperatures (Above 30 celsius), which is one thing us brits rarely have to worry about! Yes!!! Those are really really very nice pictures of Disa. Update us with the progress! I can't wait.. The flower pics are Andrew's. He does stunning work photographing his Disas. Another orchid to add to the wish list!!!! Oooh pretty, pretty Disas!! I can't wait to read about your adventure. May you grow many blooms. The pictures of the Disas are so pretty and colorful,thank you for sharing your latest adventure with us.Please keep us posted as they grow. The flower pics aren't mine, I can't take credit for that growing. Those belong to fellow orchidgeek Andrew. I got my Disa's (the ones potted up in the other pics) from him. He clearls knows what he's doing with these stunning orchids. Yes, please keep us updated, I've always wanted to try these, but never got around to it. BTW Diablo Disas has a pretty good article on culture for these on their website. I have admired Disas for a while, and haven't read up on the culture yet. This may end up inspiring me to do to more research to see if they can handle the temps in the summer around here, as well as winter around here. i'm so jealous you guys get to share Disa's there! that plant is in good hands, Kmarch do keep us posted an we look forward to upcoming bloom picts from you and Andrew! Good luck Kevin! The flowers are absolutely thrilling. Just goes to show that no matter how long you have grown orchids you will never get bored of the diversity of them. I dont know a whole lot about Disas, but I do know one interesting thing. They are pollinated by a butterfly and the structure of the flower is such that the pollinia attaches not to their back or their head, but one to each hind leg. Last edited by LouisW; 04-17-2009 at 11:33 AM. There's a big Disa grower in Washington state. 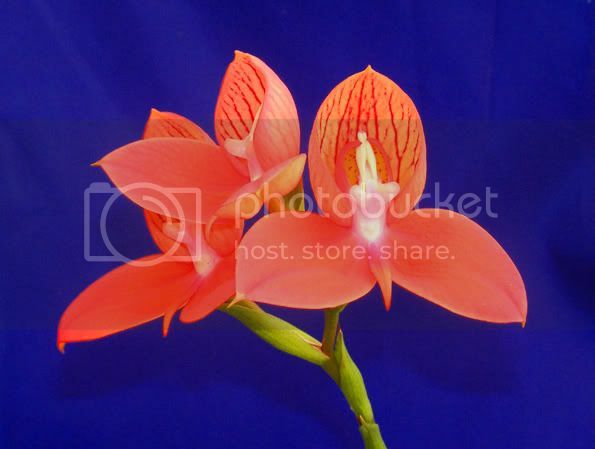 Check out the DIablo Disa link that rcb provided and check the Orchid Mall for possible vendors. Andrew recommended I repot some of the Disa deeper in the pot. I did this with all of them. Here's the result. Do these look better, Andrew? In the process of repotting I found that some of the mix, after only a week or so, was packed and soggy. From my understanding of what Andrew has told me and everything I've read, they like more of an aerated mix, "fluffy" almost. So when I did the repot I left some of the mix out and left them potted more loosely then they were before. Also I'm only watering from below now. My first couple of waterings were from above. It's been 4 days now since the repot and the mix still feels less compacted on the surface. They've had 1 watering (from below) In the shipping one of the sprouts had broken off. I planted the tuber and stump anyway. Today I noticed it greening up and it looks like it may be growing a little from the center. It looks and sounds good! I'm learning a lot from this thread- Thanks! Oh well! This really is adventure! I can only wish you good luck with these orchids! They look to be planted up well. Have fun with them. They look really great! I am following this thread as I may want to give one a try in the future! Light - You'll notice they all have grown and "beefed up" quite a bit. You'll also notice that the back two pots are quite a bit smaller then the front two. I started the back 2 pots in a shadier area, under 70% shade cloth, while the front 2 were in bright indirect light, no shade cloth. The back 2 pots, grown under shadier conditions were smaller plants to begin with, but they don't seem to have caught on and started growing as vigorous as the others. So, I suspect they do better with better light. One of the articles I read did mention that they're often found in the wild growing in direct sunlight. My light is not that bright but I have now moved all 4 of them over into the brighter light. We'll see how they do in 2 more months. Tough!!! - You may notice that in the lower left pot, it appears there are 2 plants where there was only one at the start. There were actually 2 at the start in that pot but one of them had been broken off in transit. I potted it up anyway to see what would happen and it has really taken off. I can't believe how fast that one has grown. It was one of the ones I initially put in the brighter light. They seem to be much tougher orchids than I thought. Temps - Our winter here has been cool so far. Though it was warm-ish (25C-ish) 2 months ago when planted, this past week and a half has been COLD (Melb cold, not Canada cold ). Nights have been 5-10C (40-50F) and days have been 10-15C (50-60F). I have read and been told that they prefer the cooler temps but this cold snap does not seem to be affecting them at all. Water - After potting them up I watered them for several weeks with normal tap water - hose water to be more exact. It has been quite rainy here for the last 3 weeks or so and I have not watered them at all in that time. They have received only rainwater direct form the sky. They are always sitting in about 1cm of water. Hope - Just today I found what appears to be a new shoot coming up off one of the larger plants. It is coming up at the level of the medium and appears to be coming off the stem of the larger plant. Am I observing a typical Disa growth habit or have I misinterpreted what I've seen? Another one of the smaller pots has 2 thin shoots coming up along the edge of the pot. Do I dare hope that some of the bigger plants might flower for me this year? Mix - I potted each pot of Disa in a slightly different potting mix (see above). There doesn't seem to be any noticeable, substantial difference in growth that I'd be tempted to attribute to the potting mixes. But then again the differences in the mixes were very slight. WOW! what a difference a couple of months make. Really growing well. Good luck with flowers. Love is meant to be given away. They look really good! Great growing Kevin! Really great job Kevin, they look amazing. I can't believe how fast they have grown. You seem to be giving them just what they need. Fantastic thread, Kevin! They look awesome! I'm so glad you're doing this, as I just started to grow them as well. Patti, if you wouldn't mind, maybe you could keep track of how you're growing yours, and we can compare cultural notes as we go. I just read this after Patti's thread. I think they will do well here in California from what you've observed. I hope so anyway. Do you know how cold it needs to get? Our winters only drop into the 40s and rarely 30s. Kevin, it's amazing how well they are doing in just 2 months. Now I'm really interested in getting some. Thanks for the info. and keep us posted. Especially if you get blooms this year. Do you know how cold it needs to get? Our winters only drop into the 40s and rarely 30s. Good question solay. I do not know how cool they need to get. I only know how cool mine are getting which is 5-10C (40-50F) at night. Thanks for the info. and keep us posted. Especially if you get blooms this year. I will definitely keep everyone posted. My plan is to update every month or 2. I'll be waiting for the updates. Thanks. Kevin -- You're doing a great job on growing your Disas. For those interested...I just posted some tips on how to grow these in warm environment like mine in Patti's thread (http://www.orchidgeeks.com/forum/orc...tml#post148477). I'm glad to see they're growing well for you. Hope - Just today I found what appears to be a new shoot coming up off one of the larger plants. It is coming up at the level of the medium and appears to be coming off the stem of the larger plant. Am I observing a typical Disa growth habit or have I misinterpreted what I've seen? As well as producing shoots from tubers, Disa also produce plantlets from underground stolons (similar to roots) off the main stem. These will grow and produce tubers after one or two seasons depending on how early in the season they are produced. I've tried a few mixes and, to be honest, I find they're not too fussy about what they're potted in. I prefer sphagnum simply because it tends to stay cool. South African websites I've seen often recommend mixes that essentially consist of grit. It's been 4 months since I got my Disa, 2 more months since my last update. I think things are going reasonably well. While I did loose one of the smallest plants to some type of malaise (the leaves yellowed and when I tugged on them they came out and had some sort of light brown rot at the base), all of the rest seem to be coming along nicely, continuing to grow steadily. The new plantlets I described in my last update all have multiple leaves and have increased in number, there are 9 of them now, one of which is growing out the bottom of one of the pots. I have not changed any of the culture I'm giving them. They still get watered with rain water and Melbourne city water. Still bright indirect light. Still sitting in about 1cm of water most of the time, never allowed to dry out. These are turning out to be so much easier than I ever imagined. I'm a little concerned about how I'll keep them protected from the heat this summer. How do you protect yours Andrew? Looking really good. I was tempted to buy one too but the grower will not ship this time of year for some reason. Said can pick up in person only right now. I definitely want to try one of these beauties. Those are really growing well, the leaves are so healthy looking. I was tempted to buy one too but the grower will not ship this time of year for some reason. Said can pick up in person only right now. I definitely want to try one of these beauties. Solay....it's probably because any time inside a box at this time of the year would be too hot....most likely you'd open up a package that had mostly browned out foliage. They HATE any kind of heat. Kevin looks like you are doing AWESOME with them!! GREAT job!! I'm a little concerned about how I'll keep them protected from the heat this summer. How do you protect yours Andrew? This is something I'm still trying to work the kinks out of and I do find it difficult to get flowering plants with completely unblemished foliage. Extra shading will take some of the heat out of the air and reduce the intensity of the light directly hitting the pots. I find that keeping the potting mix/root system is the most important thing. Sphagnum has a naturally cooling effect so your media will help a lot. During summer I replace the water in the trays regularly with cold water and I'll water the potting mix (not the plant) from the top with cold water if the media feels at all warm. On days in the high 20oC's and above I place ice in the trays so that the water in the trays doesn't overheat. Thanks Andrew for the cooling tips. They all sound quite practical and managable I do have a lower shelf in my shade house, under some paphs actually, that I thought might be a good place to protect them from the sun. I'll give that a try along with your suggestions when the time comes. Wow!!! They look great! Russ Vernon gave our society a nice slideshow from the International Phalenopsis associations recent get together in England and had some pictures of displays soley comprised of Disas lol. They are so beautiful! Can't wait to follow this thread till they bloom for you I don't know why I hadn't seen this thread earlier lol. Well it's been 6 months since I first posted about my new adventure with Disas back in April and 2 more months since my last update. I have to say I am very excited at the progress and I continue to learn as I watch the plants grow and develop. As you'll see in the pics that follow, some of the smaller plants have plateaued while the bigger ones have continued to grow quickly. Best of all, I'm pretty sure (Disa masters correct me if I am wrong) that 2 of my Disas are spiking. I've noticed on two of them, the two larger plants at the front in the pictures are starting to quickly grow upwards. I can see stem coming up from the "rosette" of leaves. I have moved the plants from where they were, into shadier conditions. I noticed a couple of weeks ago with increased temperatures and light intensity, as we're moving into Spring, that my leaves are lightening and have some spotting. So I have moved them to a shadier, cooler place in my yard. In a previous post Andrew mentioned he was still trying to get them to grow and flower with unblemished leaves but was finding it a challenge. So now I get to face this challenge as well! Other than the light levels and the temperatures, no cultural conditions have changed. I'm still watering with mostly Melbourne tap water and still have good air circulation (it's WINDY here today). And here's a side view of the 2 plants I think are in spike. This stem that is emerging appears to be fairly thick. Andrew, do you think it should be staked? Will it need some support? How cool! That is so exciting way to grow Kevin! Awesome, already getting some spikes from those youngsters. Congrats!!! I am way past the denial stage and just plain ADDICTED! This is a great thread. I'm really happy for you Kmarch! On average how long does it take for a disa to go from spikes to blooms? Nice. Looks like your patience is finally paying off. Can't wait to see the blooms. On average how long does it take for a disa to go from spikes to blooms? I don't know. So far, about 3 weeks and counting. The plant sent is a fairly compact grower. The spikes are short and thick enough to be pretty much self supporting. You may want to stake it if it starts to lean towards the light but otherwise it shouldn't need it. As far as how long until it flowers, it usually opens up in late November-early December for me. Andrew...or whoever else can tell me...what's the lovely orange-peach Disa in the second picture in the first post of this thread? I think I might have to add that to a future wish list. It's Disa Betty's Bay. The parentage is Disa uniflora ('Sunbird' x 'Yellow Albino') x Diores 'Sunset'. The plant came from a flask I bought from Kevin Western in South Australia and the flowers are pretty typical of the plants that have flowered so far from this flask. I had been posting updates on my Disa adventure every 2 months but in light of how fast they're growing, a one-month update is in order. The 2 plants I suspected might be starting to spike, were, and they have shot up so fast that I swear it seems like their progress has been visible on a day to day basis. A single bud has emerged from the top of each spike. Unfortunately it has been fierce hot here this week and one of the bud tips has browned slightly. I'm trying my best to keep them cook, replacing the water with cold, even bringing them in on the hottest days. Although the heat roughs them up a little bit, they do seem to be tolerating it even if their leaves don't look nice and clean and pretty. Hopefully it won't be long before I have some nice flower pics to post!!! Congrats man on your exciting adventure. Keep posting..
Congrats. I hope we get to see them bloom! Which Disa species are in spike? Good growing Kevin!!! 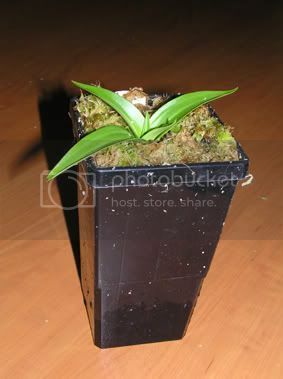 I cant wait to see the flowers, I love Disa and really want to buy one. Congratulations, Kevin! Great growing!! Mine bit the dust over the summer. I tried so hard.... Tried different mediums, switched to distilled water. They were in my basement under lights where it's cooler. I have a small fan on the chids down there. I'm looking forward to seeing your babies in bloom! Well, congratulations ! This is exciting, it has been interesting following your progress, all the more when it comes with a spike! Thanks for taking time to post all this. And finally the flowers have opened! Actually they've been open for about a week and a half now. The condition of the flowers aren't the best. I think I let them get too warm (Andrew please feel free to correct me and/or offer thoughts on what may have caused the browned tips). A guy I talked to at a recent show said that if the water they're sitting in gets too warm the leaf and petal tips will brown. So I still have a bit to learn and there's obviously room for me to improve my culture and technique, but I am quite excited that it is at least possible for me to grow them! The first two pics are of the first of the two flowers to open. The last pic is after the second one opened. The second smaller flower never opened fully and seems a little cupped. I think the browned tips held the flower closed longer than normal and have crimped the segments. Apologies for the horendous lighting on the last pic. It was taken in a hurry in the bright sun. They've flowered, but this is only half the story. After flowering the plants will start to die down and I'll begin preparations for them to go dormant, and eventually for repotting and restarting them in the autumn. Any advice on what to expect from this point on would be greatly valued, Andrew. Yes! What a great thread! Way to grow an orchid you've never tried before! Very well impressed and inspired. Great job! Greaat job Kevin! Isn't it so rewarding to try something new and challenging, and to learn and succeed? Thank you so much for letting us all learn right along with you. Coffee, Chids and Good food, what more could a girl ask for? Thanks everyone! Billie Jo, I dont know that I'd claim to have "succeeded" just yet, I havent' successfully taken them through their entire cycle yet and as you can see from the condition of my flowers that I still have a lot to learn. But I do know a heck of a lot more about these guys than when I started months ago so I suppose that is a success fo sorts, and they are still alive. You might want to check out this site Welcome | www.disas.com. It is really very complete and has links to many other resources. congratulations kevin! this is a big accomplishment and I know you'll be able to continue to grow them on better and better. Excellent job Kevin!! Getting them to this stage...first time...is something to be very proud of. You're far braver than I! I love them...just don't have the nerve to give them a go. My local OS President grows these...a lot of these...and even after more than 10 yrs (I think he said 15) he gets brown tips on the leaves from time to time. He said he killed them for the first 10 years before getting a bloom. Soooo....excellent job!! I don't know if it'll help but he said what he does is he keep jugs of R/O water in the fridge and 3x a day he circulates freshly chilled water through the trays. Any new orchid that I get and keep alive I call success. LoL I would have killed the boogers during Stage one. There were a few very hot days in November so its not surprising you have a bit of browning on the petals. I wasn't prepared for the hot weather and my plants got knocked around a bit too. As I said, I'm still adjusting my culture to tackle the issues of heat stress. For the most part, my Disa do survive and multiply each year so they "live to fight another day" while I find out how to get the most out of them.